Do you have ancestry in the South Australian education industry? 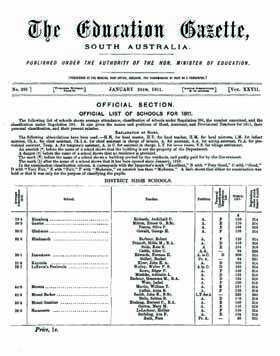 The South Australian Education Gazette was issued monthly and contains a wealth of information for family, local, educational and social historians. Now, you can browse or search the gazette at your own convenience - a resource you may not have had ready access to, or the time to use in a library. This is a wonderful genealogy tool for anyone exploring their family history or building a family tree.